If you’re a snake, one of your favorite foods is eggs. Once you crush that pesky shell, they’re delicious and nutritious, and best of all they don’t fight back. But one problem that many snakes face in the modern world is swallowing round things that unfortunately aren’t eggs. 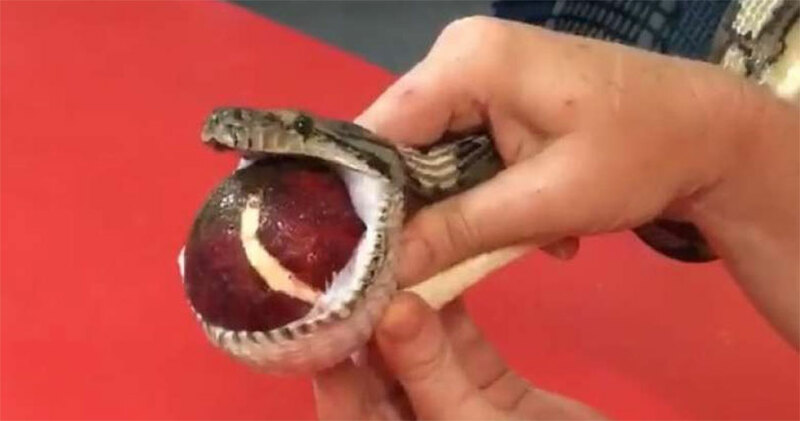 Case in point: a four-foot carpet python in Townsville, Australia, who swallowed a tennis ball. The agonized reptile was spotted by homeowners who called in expert handler Brian West to help it. The snake had gulped the ball down without realizing what it was, and it took nearly a half an hour for West to massage it out. Here’s a video if you don’t believe me. Thanks to the Straits Times for the tip.